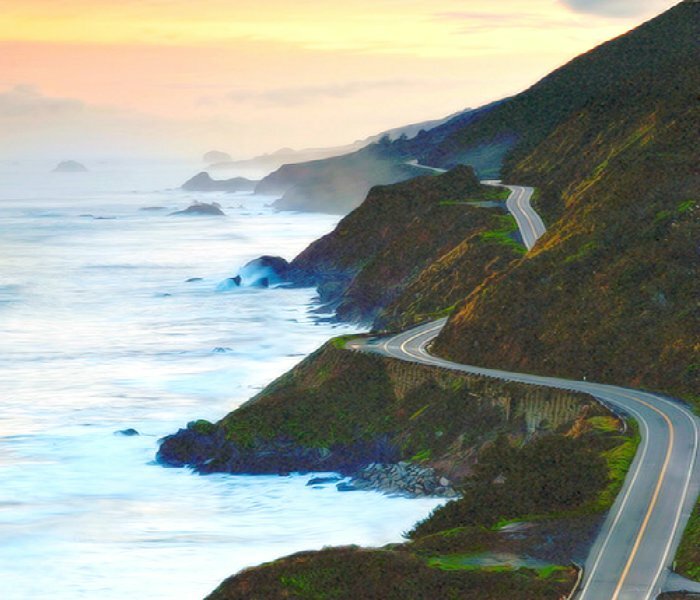 Last week I posted Dramatic Drives – Pacific Coast Highway and had such an awesome amount of requests for the rest of the journey that here it is… Dramatic Drives – Pacific Coast Highway North, a continuation of SR1 or Highway 1 in California. 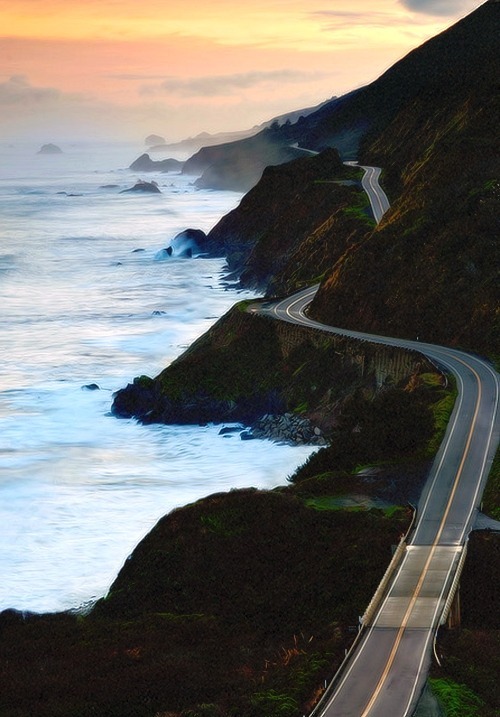 After crossing the bridge and entering Marin County, Highway 1 then splits from US 101 again near Marin City, where it leaves the city and, as the Shoreline Highway, returns to a winding, two lane road as it passes over the Marin Hills. This part of the drive makes you forget that the large San Francisco Bay area cities are so close. You’ll be transported to another world almost immediately. 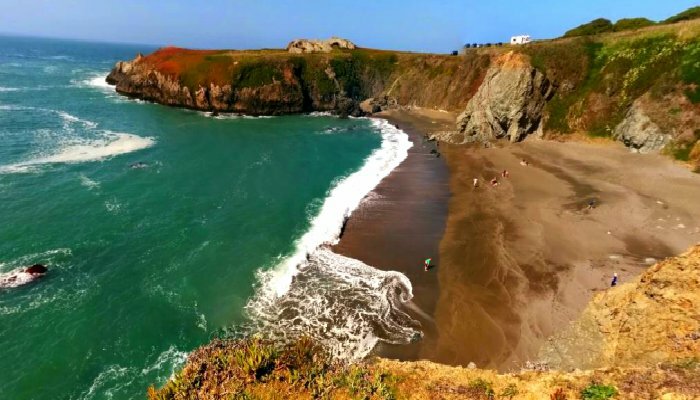 After 17 miles of this beauty, you’ll arrive at Muir Beach. 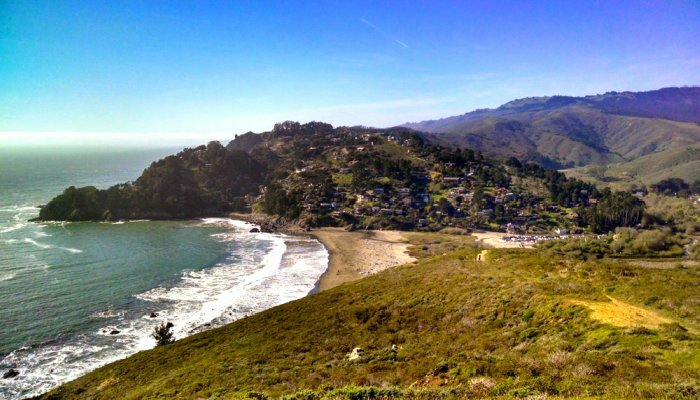 Make sure to stop and walk out to the Muir Beach Overlook. 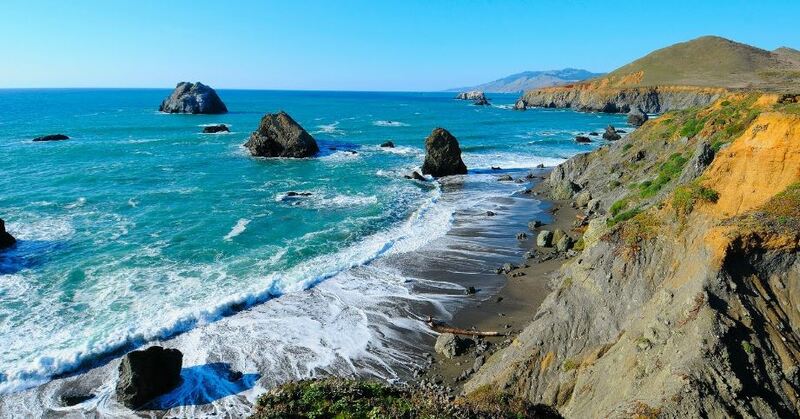 Spend some time enjoying Muir Beach too! If you do decide to stay, we recommend the Pelican Inn. 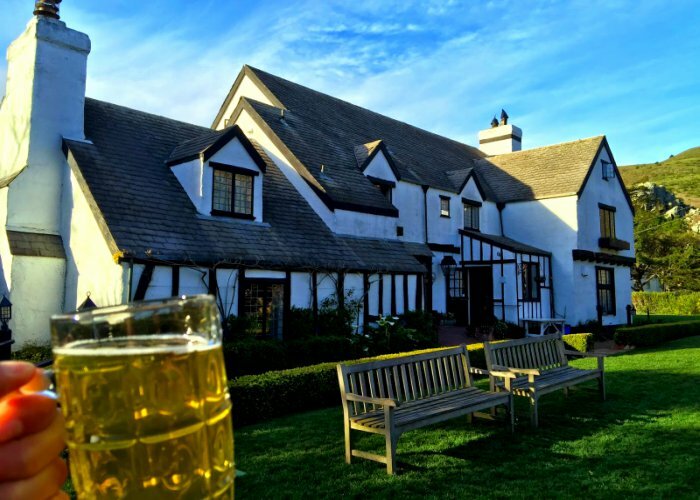 This quaint inn with old English style is about 1/2 a mile from Muir Beach. The inn’s pub offers classic British fare, and guests receive a complimentary full English breakfast. Cheers! If you’ve spent the night, you’ll want to get up, check the fog conditions and then head op up the coast to Slide Ranch where they always have something going on. 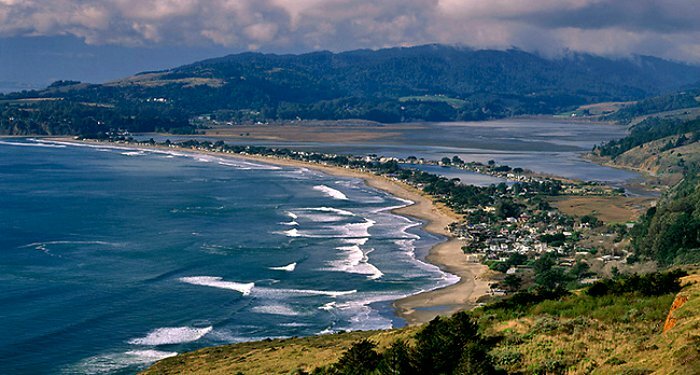 After a while you will pass the Stinson Beach Boulders, Stinson Beach and the Bolinas Lagoon. 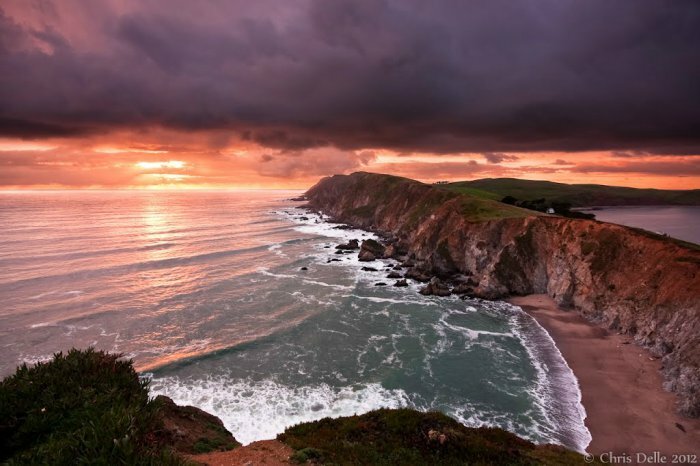 Highway 1 then avoids the immediate coastline of Point Reyes National Seashore and the rest of the Point Reyes Peninsula, and instead heads towards, and then along, the eastern shore of Tomales Bay. Can you picture yourself there? 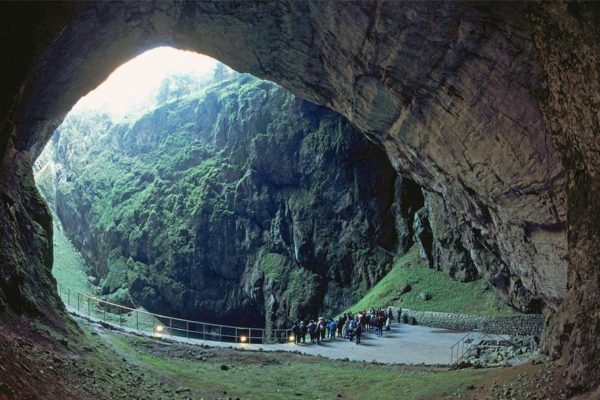 People say this place does not exist – or that they cannot find it but we’ve seen it and it;s worth looking around. Hint: The rangers will gladly tell you where it is. The area around Pierce Point Ranch is worth staying the entire day. 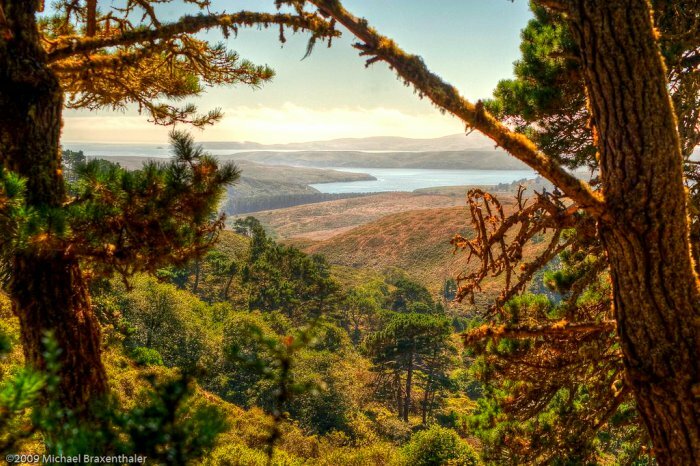 Point Reyes National Seashore has a long history of being a magnet for boats. 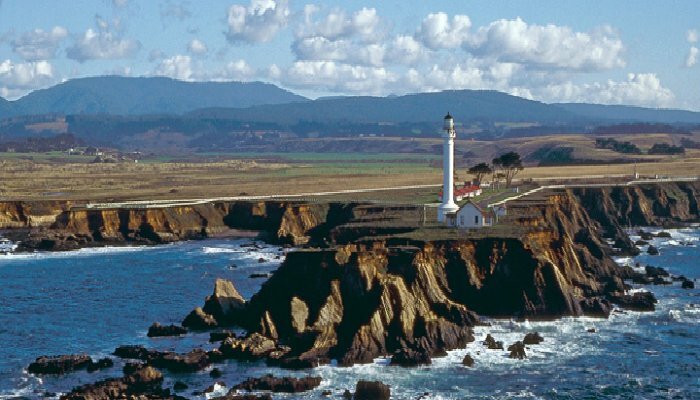 In an attempt to reduce the high number of shipwrecks along the rocky coastline, the US Lighthouse Service built the Point Reyes Light Station in 1870, yet despite their efforts, over 50 ships have been lost in this area. 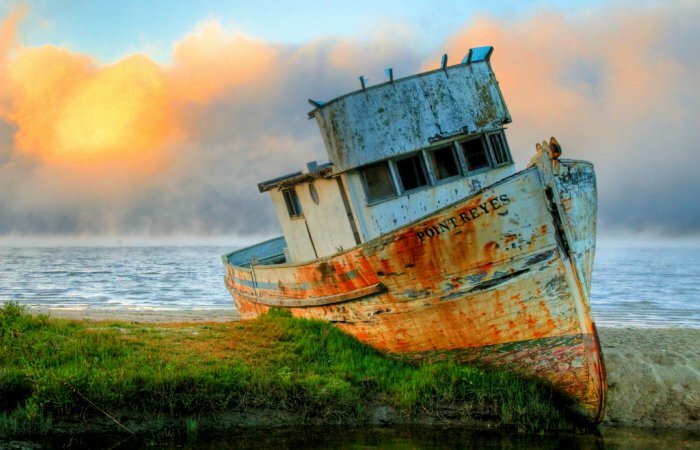 The SS Point Reyes can be found on a sandbar at Dancing Coyote Beach nearby Inverness. 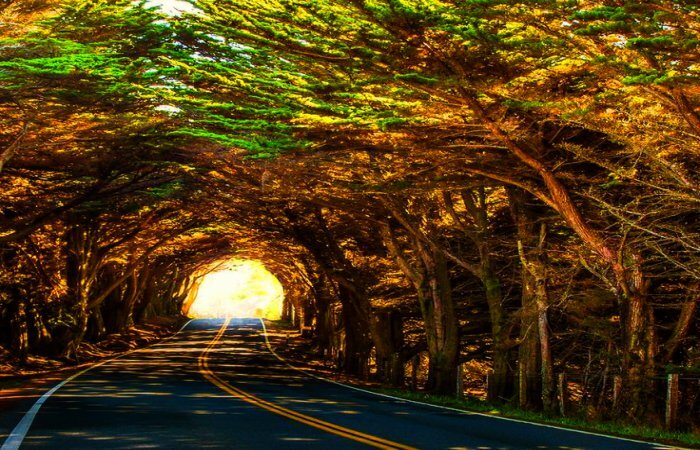 In fact, here are some more awesome photos as well as a map of The Point Reyes shipwreck and the famous Point Reyes Monterey Cypress tree tunnel. 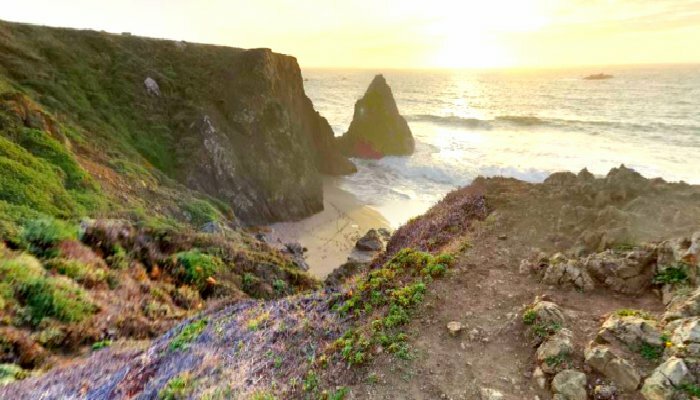 If you are a hiker, we recommend getting yourself out to Alamere Falls as wells and seeing more of what the Point Reyes Peninsula has to offer. 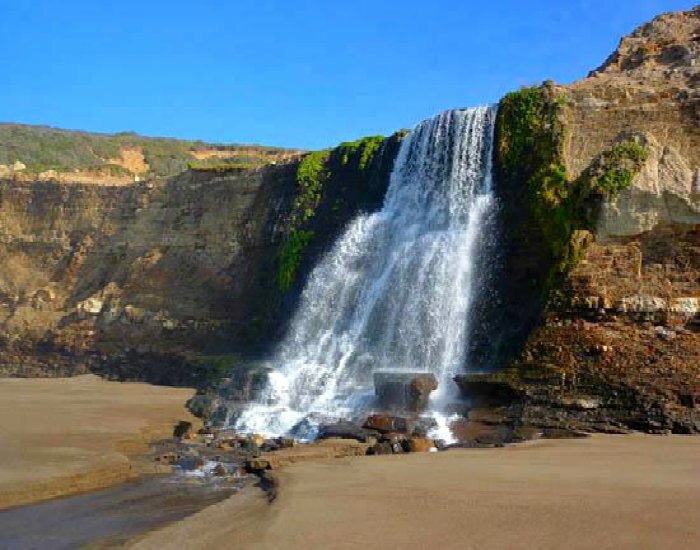 Alamere Falls is only a hundred or so feet high, but above are several smaller cascades and the energy of the surging water commands attention, making it dominant feature of Wildcat Beach. 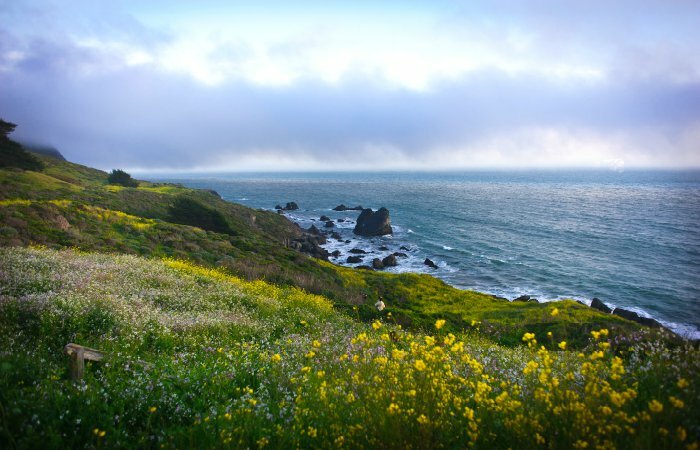 Hiking the open trail through the Tule Elk Reserve offers spectacular views of the Pacific Ocean and is a prime wildlife viewing trail. Just make sure to wear ear cover and monitor the weather because fog can limit visibility and and wind make these hikes much more challenging. The trail to Windy Gap is relatively level. At Windy Gap, one can look east down into White Gulch where there is a spring to which the elk are attracted. 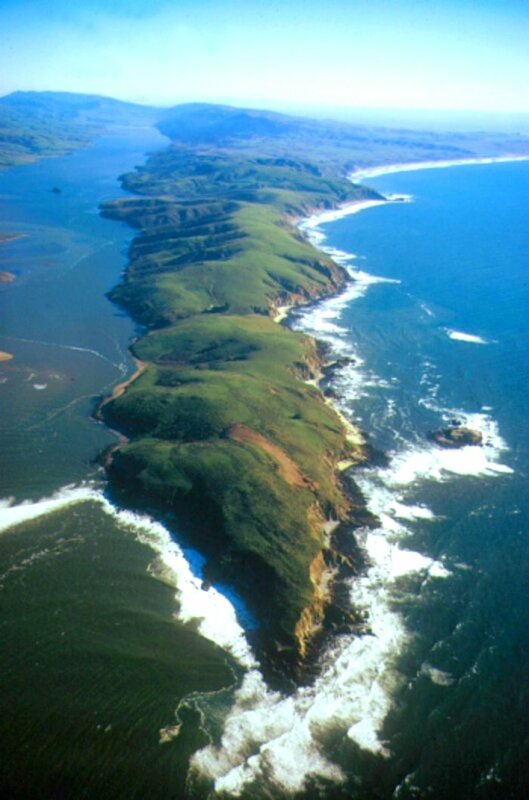 Hikers wanting to hike further can continue another 6 km (3.7 miles) to the north tip of Tomales Point. Beautiful Tule elk can also be found in several locations within the park. 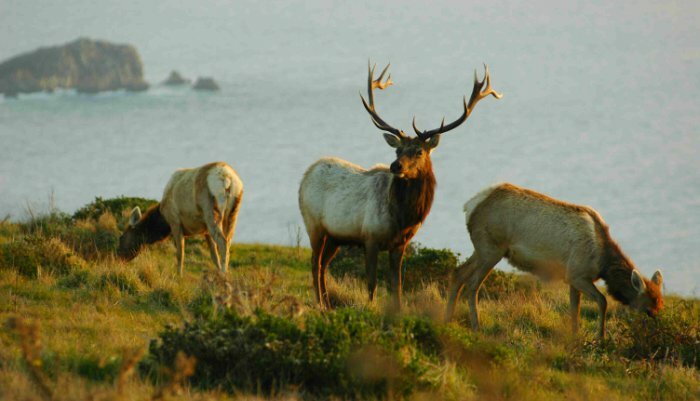 The best chance of seeing them is in the Tule Elk Preserve at Tomales Point. They graze freely and are often seen near the road as you drive into the preserve. 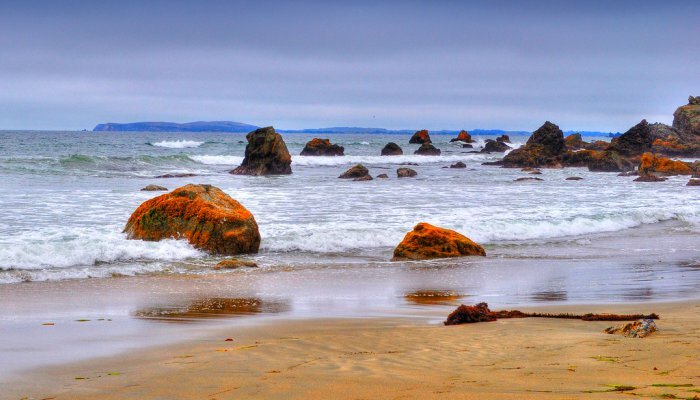 When in Tomales Bay you may want to grab some lunch and head out to Dillon Beach and photograph some of the rocks. The beach is only 3.25 miles west of Tomales. 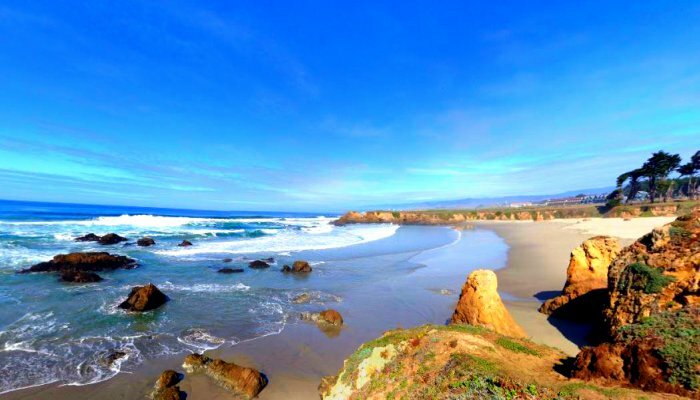 You won’t see it from the highway because Highway 1 has headed further inland to intersect with Valley Ford Road just north of the Sonoma County border, but we love this peaceful beach because of it’s wide and lengthy white sand expanse great for long walks. It’s a dog-friendly place too where your pooch can be unleashed and run loose. As you drive you’ll realize that not much has changed. 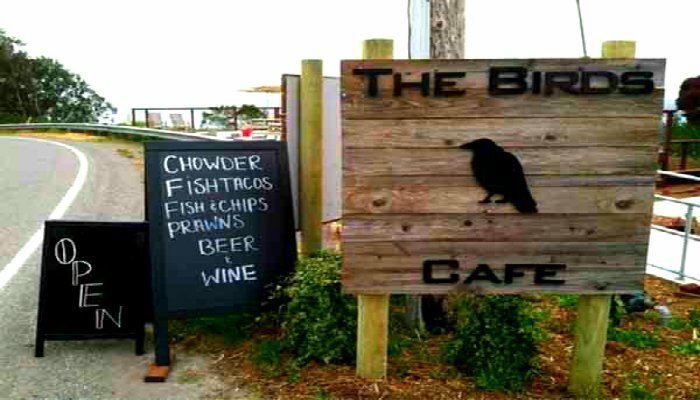 Except that maybe these days you can stop in and eat at The Birds Cafe located at 1407 Highway 1, Bodega Bay. After a few miles, you’ll come upon Duncan’s Landing. Stop and look around and make sure to check out Duncan’s Cove. 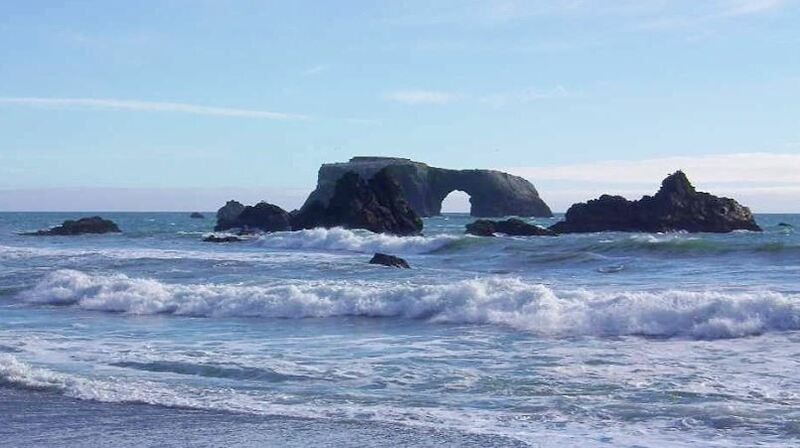 The Sonoma Coast is comprised of several beaches separated by rock bluffs and headlands. Sonoma Coast State Park spans 17 miles from Bodega Head to Vista Trail which is located approximately 4 miles north of Jenner. 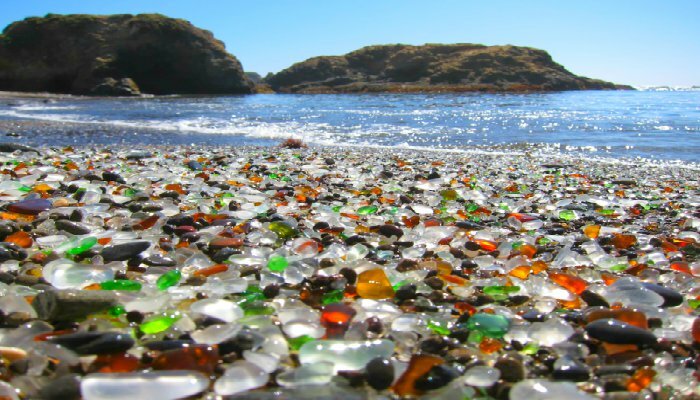 Shell Beach is a popular place in the area. It’s quite a climb down but trust us, it’s worth it. Beachcombers, fishermen, sunbathers and picnickers can access the beach from more than a dozen points along the highway. These beaches are my personal favorite beaches. Maybe because I lived in Sonoma County for a while and I know them like the back of my hand. 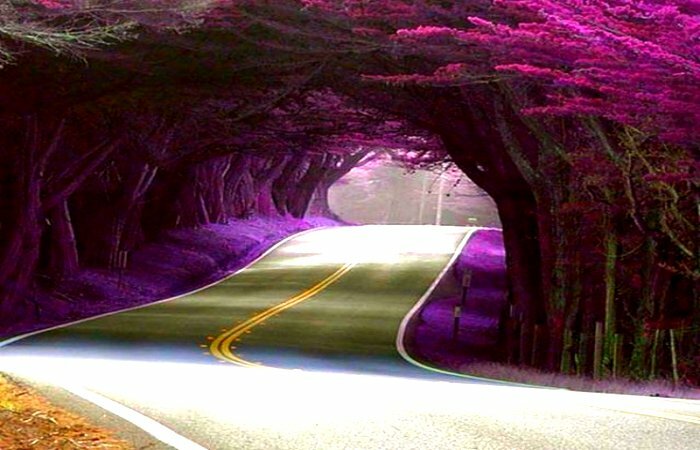 At times the road winds closely, and other times it pulls away, but the views are gorgeous nonetheless. The weather along the coast can be variable and layered clothing and head covering is recommended because it is super windy. 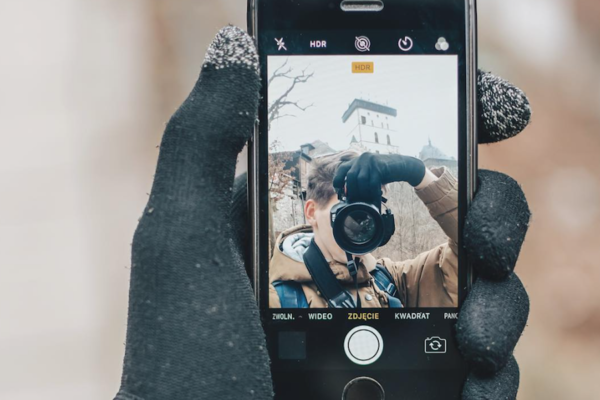 We suggest having a fully charged cell phone available for use in case of an emergency too. 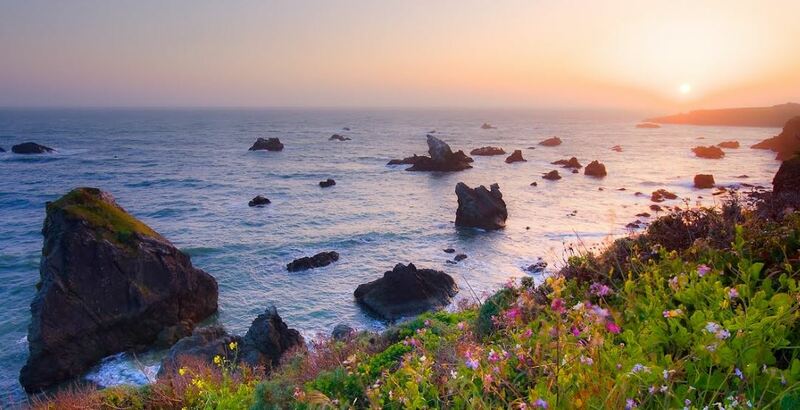 Broad, shining beaches and secluded coves, rugged headlands and natural arches, and a craggy coastline with tidal pools and reefs characterize one of California’s most scenic areas. But again… be careful. Did you know that these peaceful areas are known for their “sneaker waves”. This is when very large waves can sweep up on the beach and carry off the unwary. 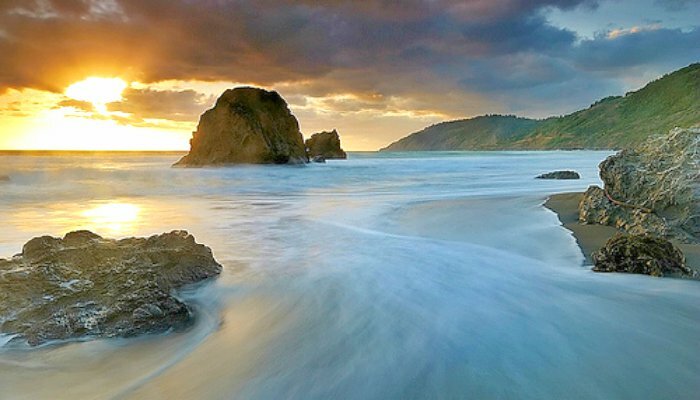 Goat Rock Beach is located between Goat Rock Point and the Russian River along the Sonoma County shore near the town of Jenner. There are two parking lots for Goat Rock Beach. One is at the north end of Goat Rock Road with easy access to the sand spit at the mouth of the river and the other is right below Goat Rock itself. 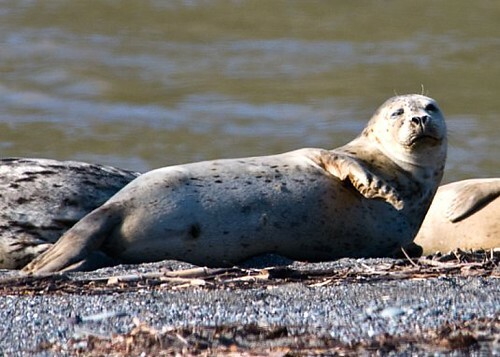 If the local colony of seals is present then stay at least 50 yards back. They can often be spotted right at the river mouth. Dogs are prohibited from the beach north of Goat Rock, however they are allowed on Blind Beach south of Goat Rock. 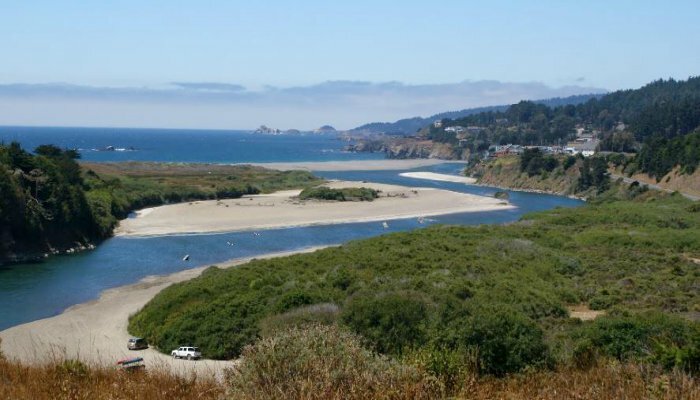 After bridging the Russian River at Jenner, Highway 1 continues to wind along the rugged coast to Fort Ross, Salt Point State Parks, and the planned community of Sea Ranch. 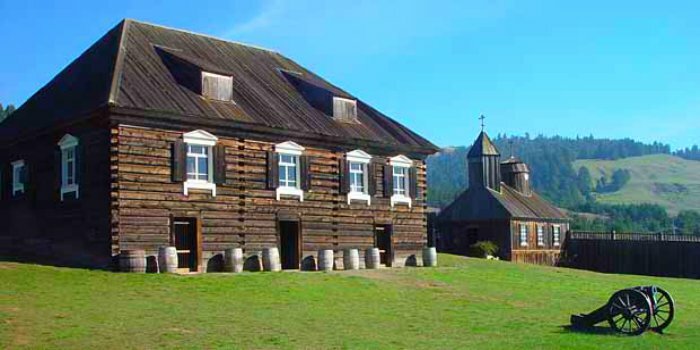 Fort Ross State Historic Park includes the former Russian fur trading outpost of Fort Ross plus the adjacent coastline and native coast redwood forests extending inland. 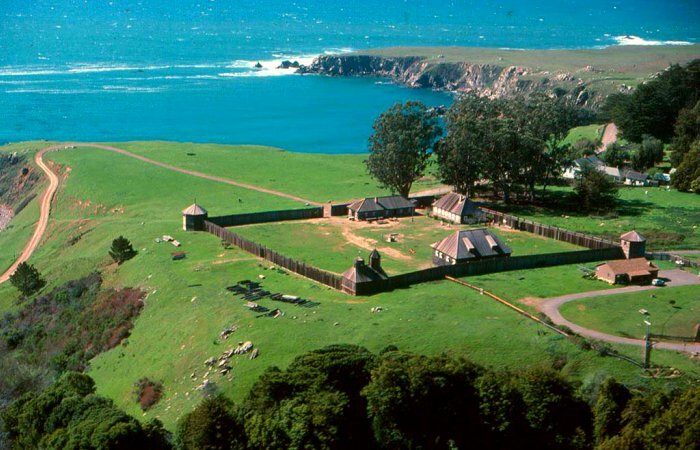 Fort Ross was active from 1812 to 1842 and was the southernmost settlement in the Russian colonization of the Americas. The area has over 3,300 acres and was established in 1909. Definitely worth a stop and if you can get there when they have their annual Russian Heritage Day and you’re there to celebrate, even better! Next on the map is Salt Point State Park. 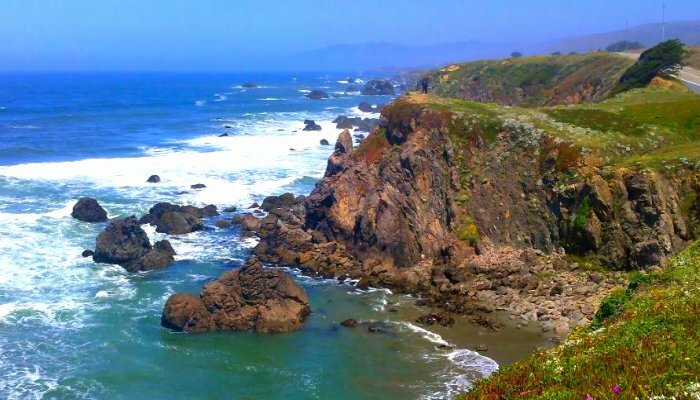 The park covers 6,000 acres, with 20 miles of hiking trails and over 6 miles of a rough rocky coastline including Salt Point which protrudes into the Pacific Ocean. 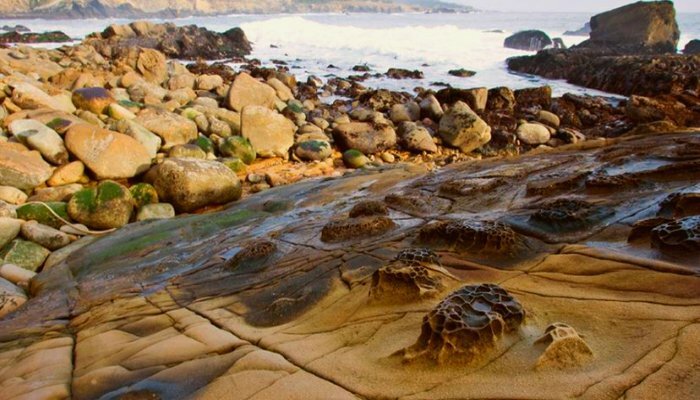 The park also features the first underwater preserves in California. 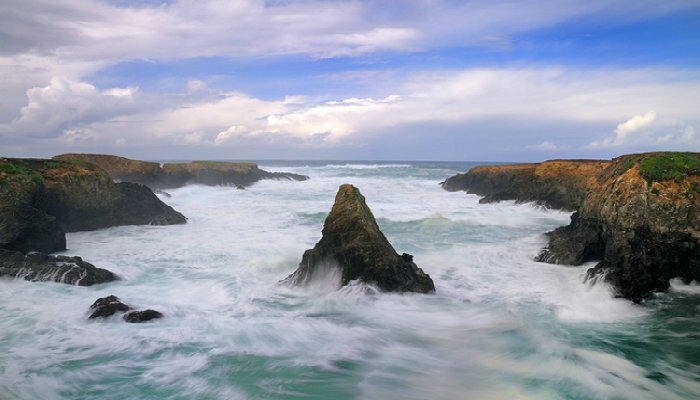 The constant impact of the waves forms the rocks into many different shapes. 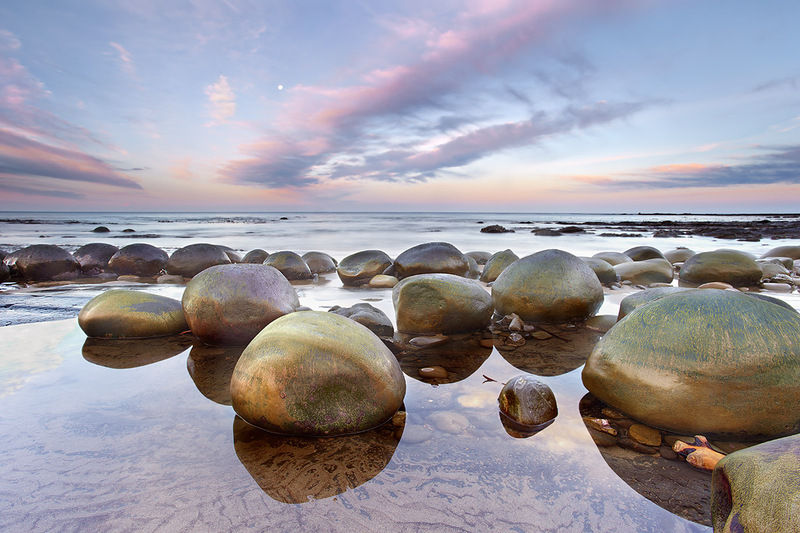 These rocks continue underwater providing a wide variety of habitats for marine organisms. The activities at Salt Point include hiking, camping, fishing, scuba diving and many others. The weather is cool with fog and cold winds even during the summer. 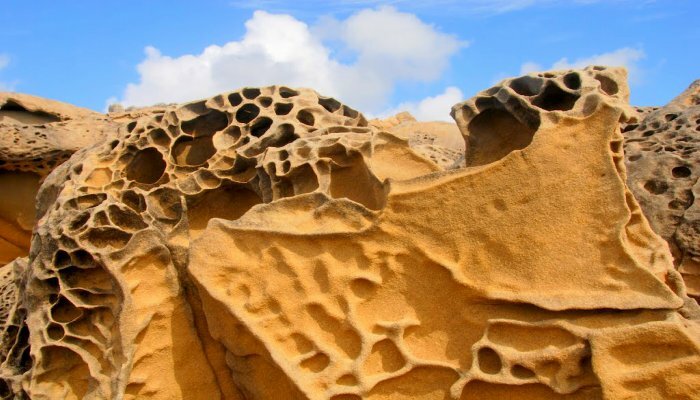 The rocks of Salt Point are sedimentary sandstone. 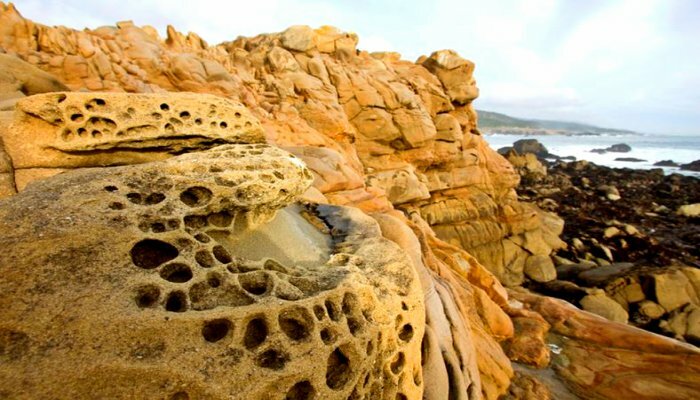 Due to the large amounts of sandstone, small cave-like features called tafoni can be found along the shore of Salt Point. 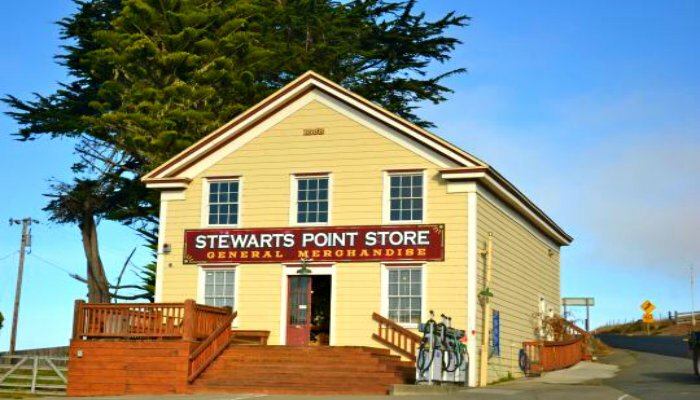 After you leave the area and continue north, make sure to stop in at Stewart’s Point General Store. This family owned business has been “in the family” since it’s establishment in 1868 just after the Civil War. It is an old fashioned kind of place and the front porch is one of the best places in the vicinity to learn what is going on in the area. You may have had a full day by now so a comfortable sleep may be in order. 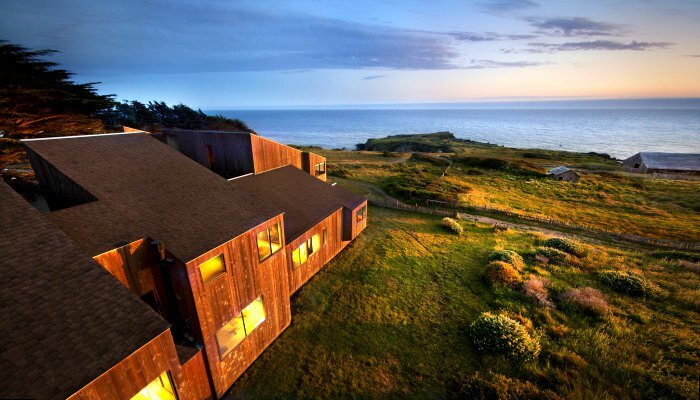 We recommend The Sea Ranch Lodge. Get there in time to watch the beautiful sunset. And if hotels aren’t your thing and you prefer to camp, you’ll want to head a little further north to the Anchor Bay Campground. 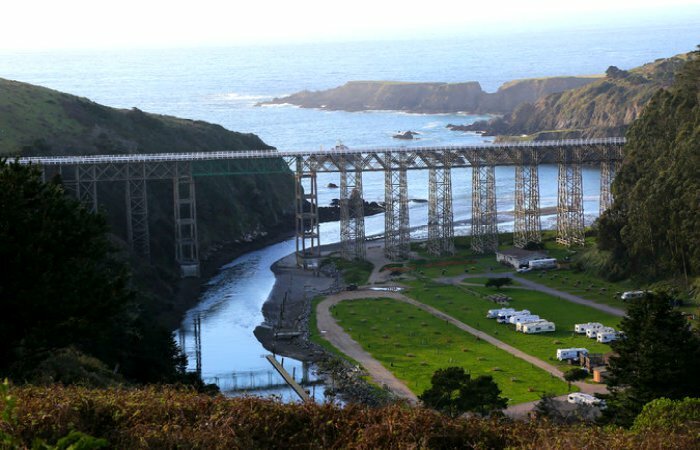 Highway 1 then crosses the Gualala River and enters Mendocino County. 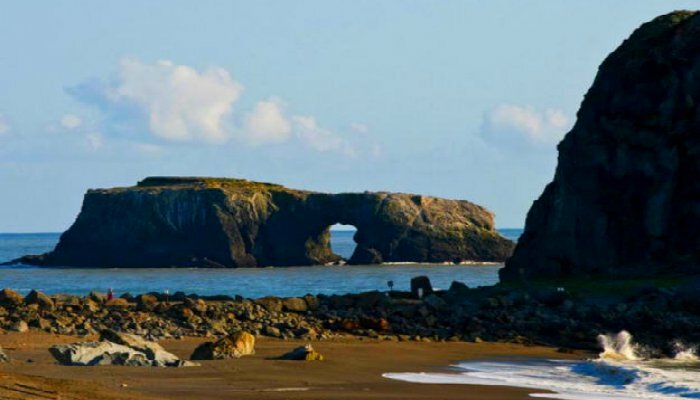 As you drive up the coast, make sure to turn off at Gallaway and head down to Bowling Ball Beach. 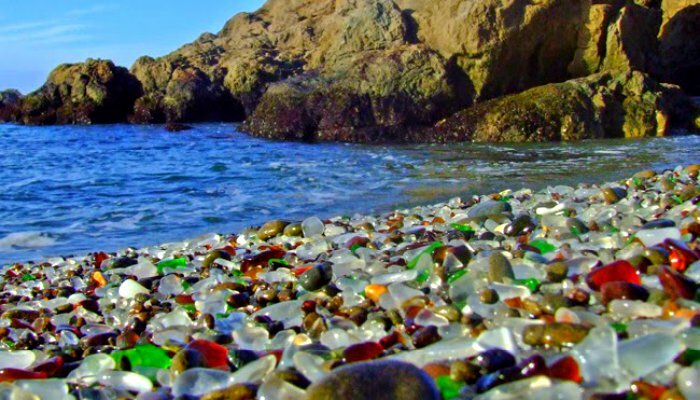 It is a part of Schooner Gulch State Beach. 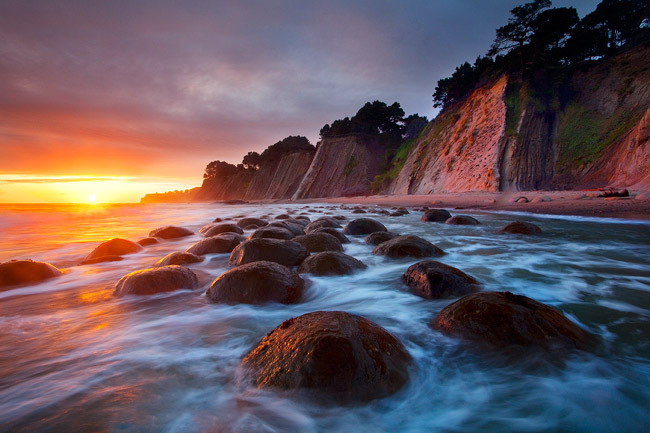 It’s named for the many unusual spherical sandstone concretions found there. Thousands of rocks appear to have gathered together to defy the tides like an army of small boulders. The weird thing is that these boulders are uniform in size and shape, as well as in their spacing, though man has nothing to do with it. The bowling ball rocks after which the beach is named are best seen at low tide. At the lowest ebb, the strangely neat rows of these ‘balls’ appear in all their glory, and you wonder how they could possibly have got there. Bowling Ball Beach looks like an intricately designed art installation, but the only artist at work there has been nature herself. 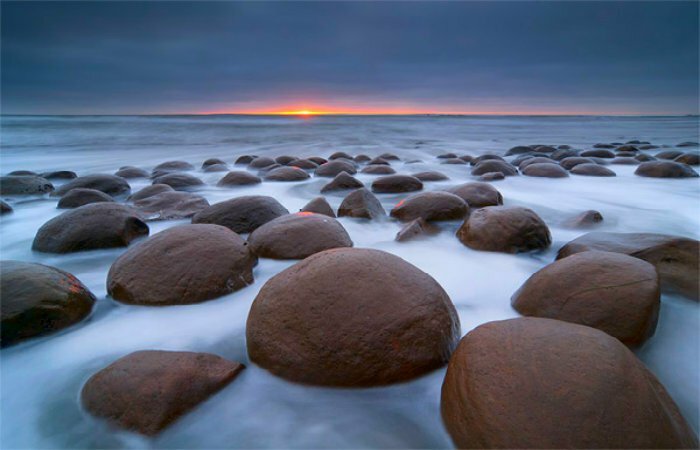 Round boulders, roughly four to five feet in diameter, begin poking out of the water with the shifting of the tides, and no matter how rational their origin might be, you cannot help but feel like a mote in God’s eye when you see them. Continuing north, you will enter Point Arena. The city itself is built around a small natural cove, used as a harbor, and is located about a 1.5 miles south of the actual Arena Point, a narrow peninsula jutting around 0.3 miles into the Pacific Ocean. 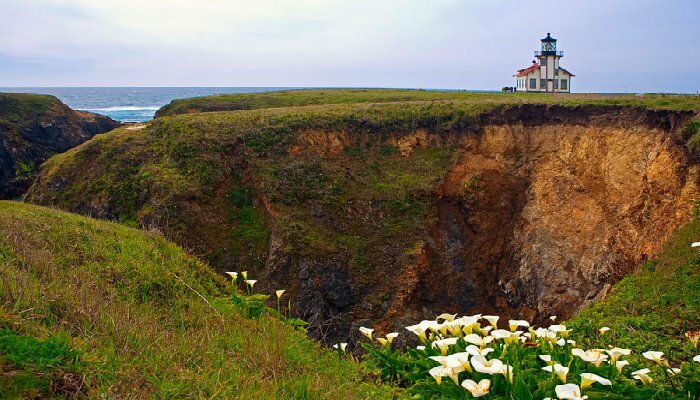 This is the location of the Point Arena Lighthouse, at 115 feet the tallest lighthouse on the West coast of the United States. The lighthouse is also the closest location on the mainland (excluding Alaska) to Honolulu, Hawaii at a distance of 2,353 miles. This is also a gorgeous coast and a bit more isolated. You’ll be super lucky to see it sunny with long distance views. Oftentimes the area looks more like this – covered with a haze and a light fog. 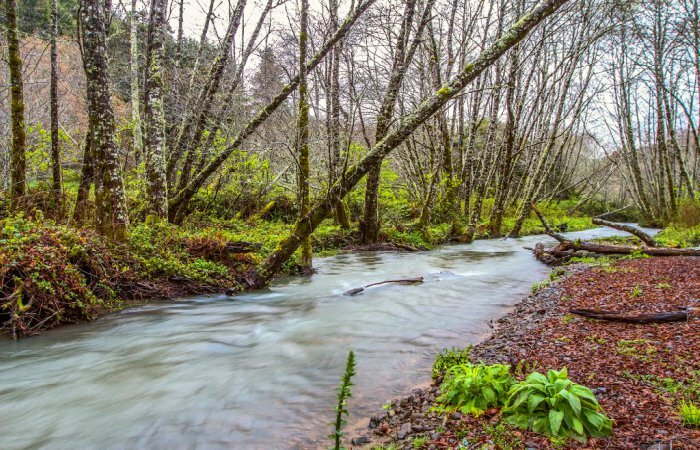 The highway will bridge the Garcia River and then, near Elk, the Navarro River, where it meets with Highway 128. 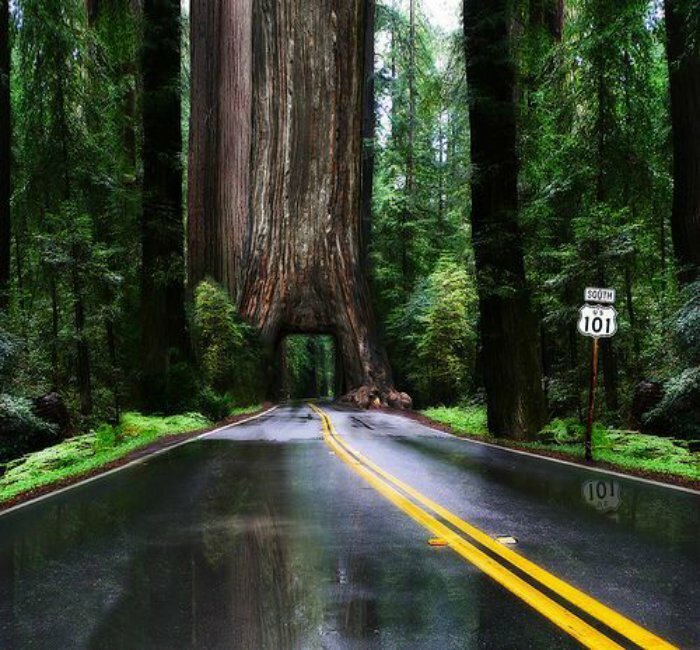 Take a detour and cruise up Highway 128 for a perfect view of glorious redwoods. 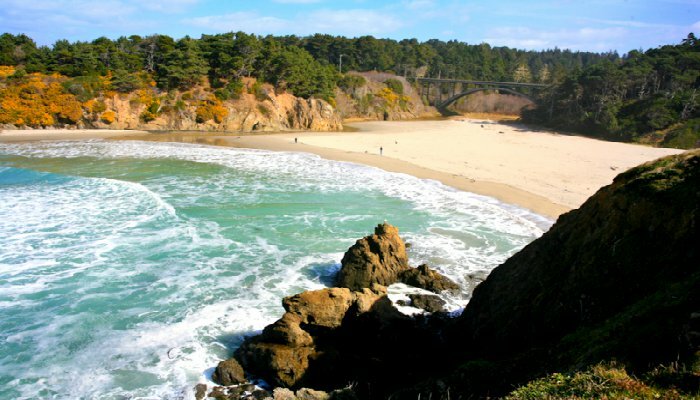 Navarro Beach is part of Navarro River Redwoods State Park. 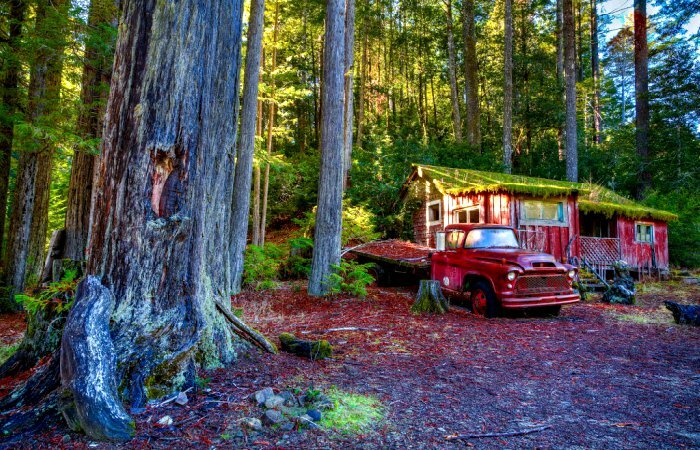 It sits at the end of 16 miles of gorgeous, pristine and virgin redwood forest. 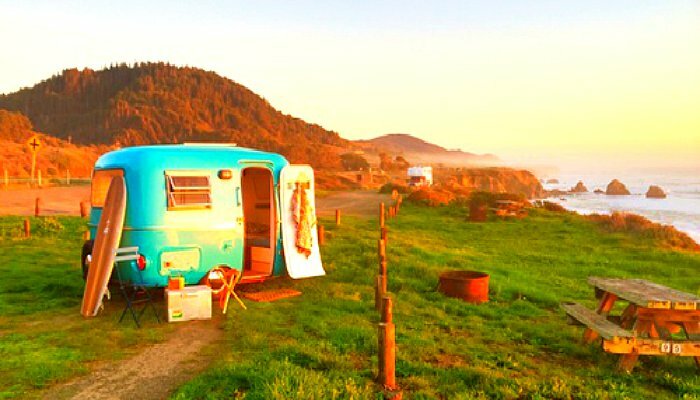 At the mouth of the Navarro River, is Navarro Beach, where you’ll find camping facilities, great views and an amazing view. The park land near the Navarro beach includes several historic buildings. Captain Fletcher’s Inn was built by Charles Fletcher, a Scottish sailor who came to the area in 1851 and was the first European settler on the Navarro estuary. In 1860, Fletcher sold most of his land to Henry Tichenor and Robert G. Byxbee, who built a lumber mill on it in 1861. The inn remained open until the 1970s; the Navarro Mill Company House, and the Mill Superintendent’s House (now home to the Navarro-by-the-Sea Center, a nonprofit group that maintains the buildings) also remain. At the town of Albion, the Albion River is spanned by the Albion River Bridge, the only remaining wooden trestle bridge on the highway. 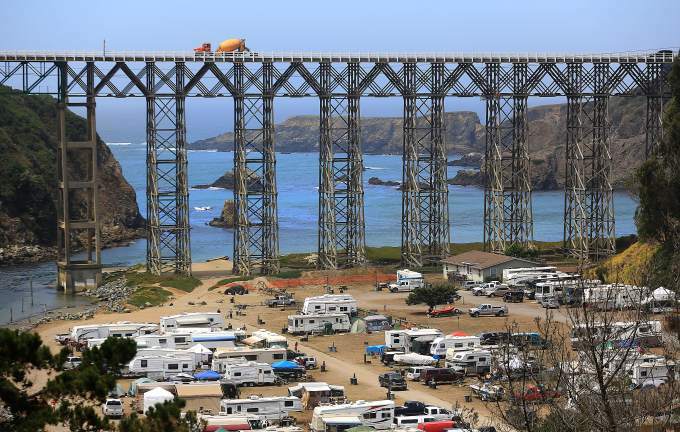 People love to camp underneath it at the Albion River Campground & Marina. 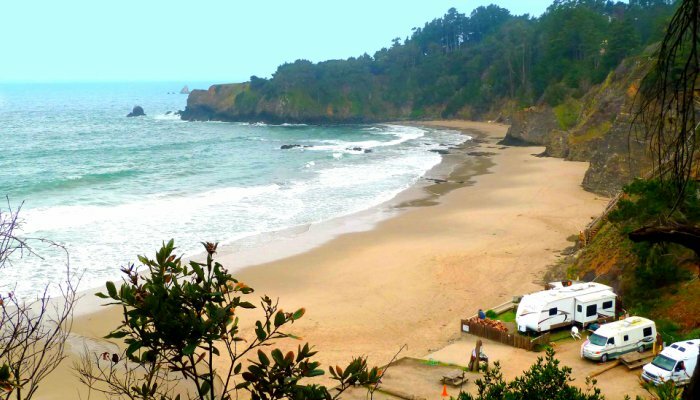 Located on the Albion Cove where the Albion River meets the Pacific Ocean, the campground is one of only two sites on the Mendocino Coast that provides both sheltered river moorage and ocean access. 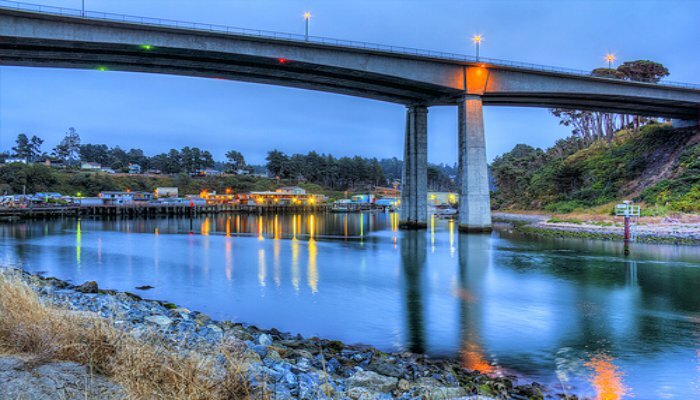 The campground is an annual destination for abalone dive clubs, avid cod and salmon fishing groups, crab lovers, and kayak & canoe enthusiasts. 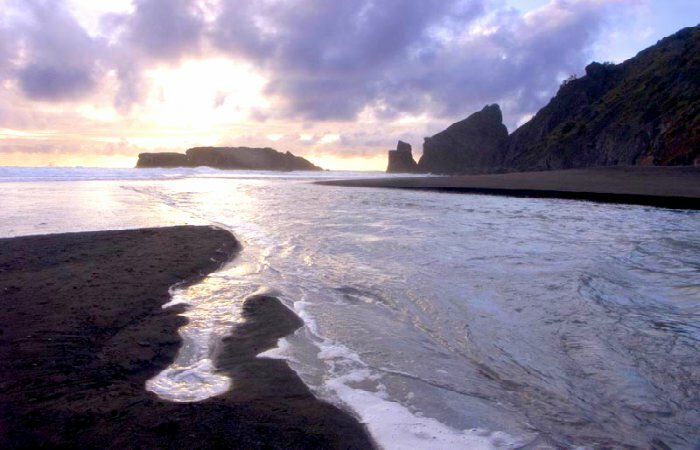 Boaters can either brave the ocean swells or explore the scenic Albion River. … And crossing the bridge. Scary! Especially when you know that State officials say the Albion River Bridge would be too vulnerable in a major earthquake. Highway 1 then winds along and passes through Little River where you will surely want to stay at Heritage House Resort. 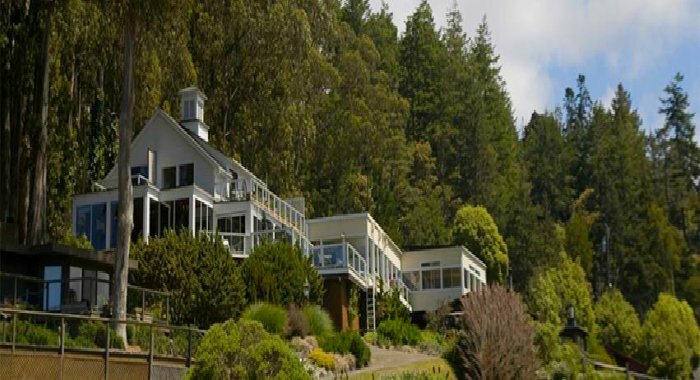 Known to many as a hidden gem in Northern California, some recognize and remember it as Heritage Hill Inn. 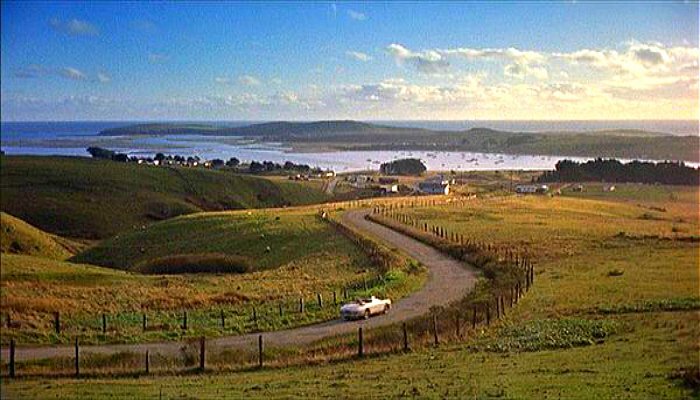 It is where one of my favorite films from 1978 was filmed, Same Time Next Year. 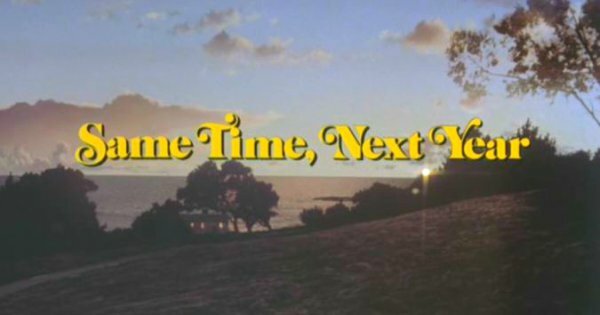 The film stars Alan Alda and Ellen Burstyn and takes place beginning in 1951 at an inn located on the Mendocino County coast. Doris is a 24-year-old housewife from Oakland who meets George, a 27-year-old accountant from New Jersey at dinner. They have an affair, and then agree to meet once a year to rekindle the sparks they experience at their first meeting, despite the fact that both are happily married, with six children between them. Over the course of the next 26 years, they continue meeting each year. During the time they spend with each other, they discuss births, deaths, including George’s son Michael dying in Vietnam, which changes George politically, and marital problems each experiences at home, while they adapt themselves to the social changes affecting their lives. Recognize the main house in both photos. Worth the stop just for that! At their meeting in 1977, George explains that his wife, Helen, has died earlier in the year, and revealed to a friend that she had known of the affair for 10 years without telling George. 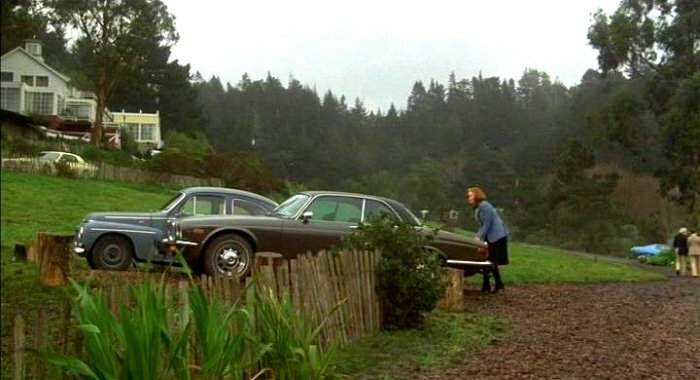 Now a widower, George proposes to Doris who refuses to accept because of her loyalty to, and respect for, Harry. Rejected, George leaves for good, only to return with the promise to continue the affair as long as they are able. It’s a very sweet film, showing how people change and yet remain the same over the years. The Resort is a destination you have to experience for yourself. 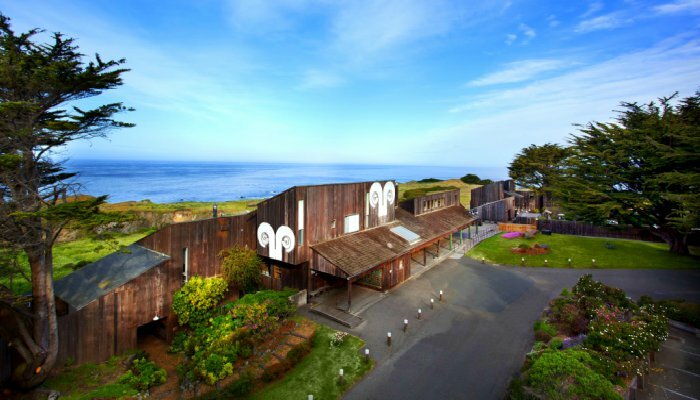 Located on 37 acres covered in cypress, eucalyptus, and lavender; the Heritage House Resort is paradise on the Pacific. Heritage House Resort is located at 5200 N Hwy 1 Little River, CA 95456. There are many photo opps and vista points along the way. Van Damme State Park has diving if you are up for it. The dive site at Van Damme is directly across the street from the State Park entrance. The park has 74 campsites with all the amenities, and a riverside foot trail. 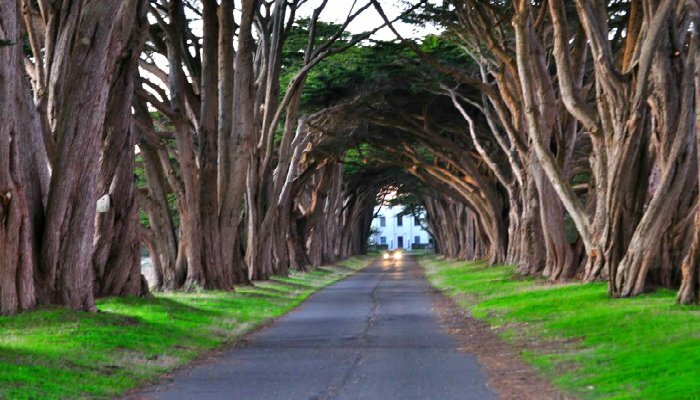 Weaving, winding and crossing all kinds of bridges and rivers on this road trip, you’ll eventually come out in the Victorian community of Mendocino. 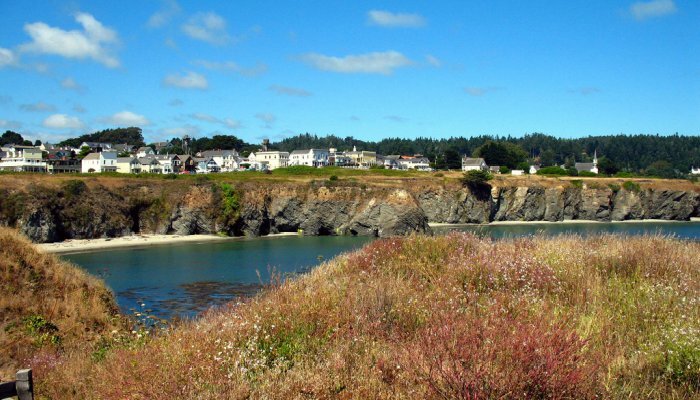 Mendocino was settled in the mid 19th century during the lumber boom and then the gold rush. In the 1950’s it was primarily an artist colony. Today it has a handful of galleries, organic restaurants with names like the Moosse Cafe and a few shops. 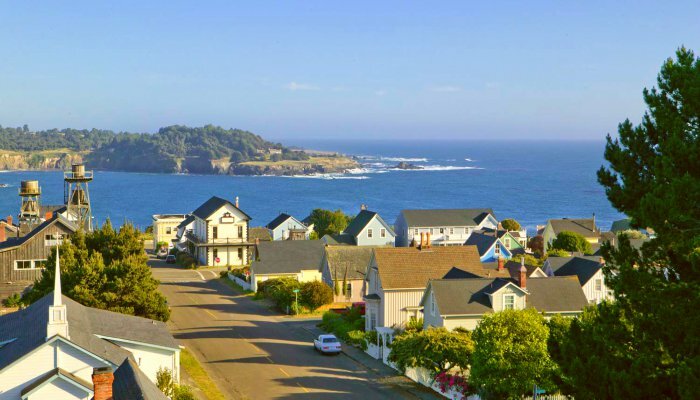 The best part is just being in the little village of Mendocino. 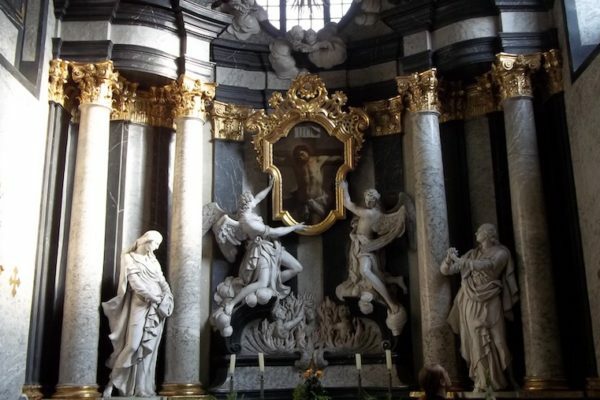 Haunting and at the same time spiritual, it casts a spell that follows you home and it lingers for a long time. If you can, try and book a nice bed & breakfast in the area. We love the MacCallum House. This historic home was built in 1882 by William Kelley as a wedding gift to his daughter Daisy MacCallum. 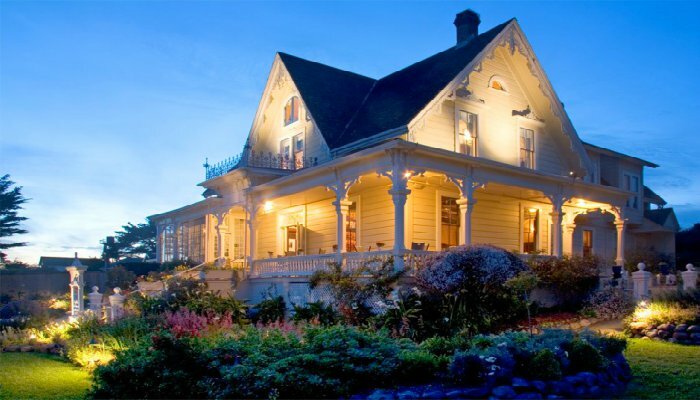 The home is a historic landmark in the center of Mendocino. It is surrounded by lush gardens and expansive lawns and is walking distance to everything downtown has to offer. 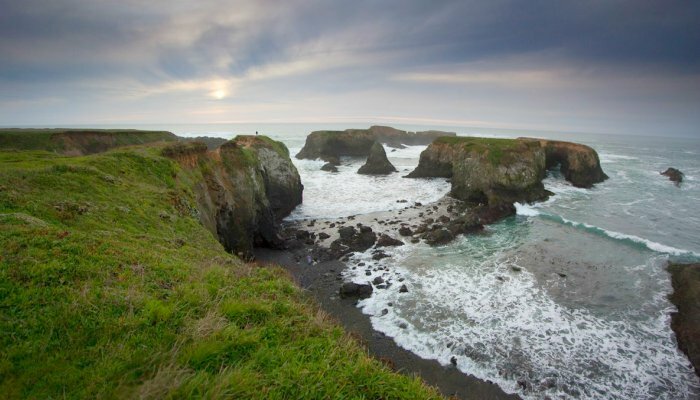 You’ll also want to make sure you have enough time to visit Mendocino Headlands State Park. 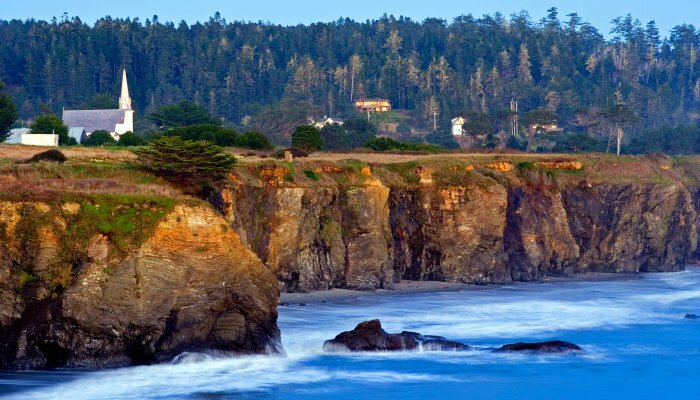 The park offers a unique blend of gentle trails, rugged coastline, secluded beaches and timeless history surrounding the picturesque Village of Mendocino on three sides. 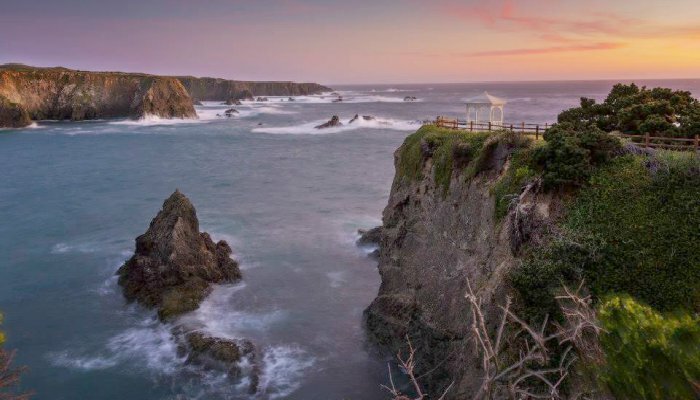 Any time of the year, it’s beautiful and miles of trails wind along the cliffs, giving the casual explorer spectacular views of sea arches and hidden grottos. 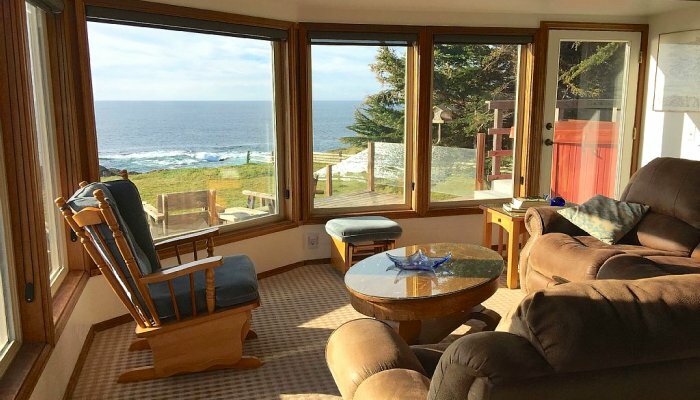 If you do not want to stay in town and prefer a little more privacy, we recommend The Whale Watch House. 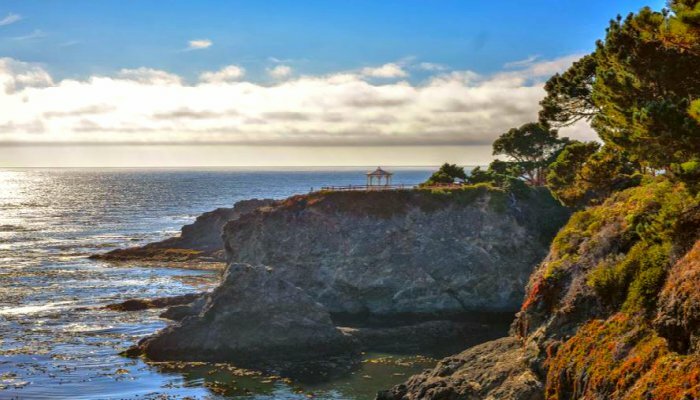 This is a VRBO rental and is located in one of Mendocino’s best-kept and most-exclusive coastal neighborhoods just one mile north of the historic Mendocino Village. 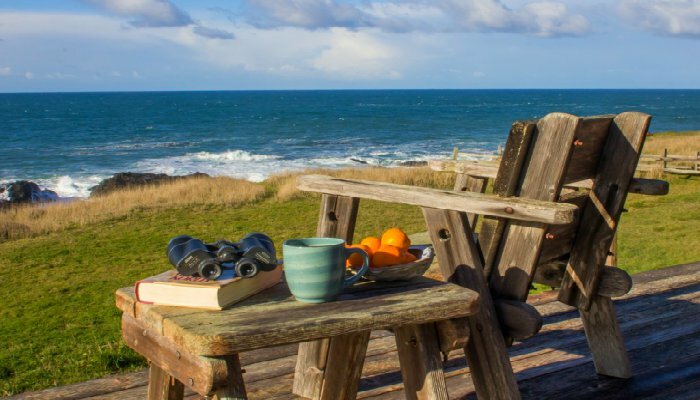 You’ll be able to enjoy a morning cup of coffee or an afternoon glass of wine on the large deck and watch the seals, migrating whales, as well as an abundance of wildlife including black tail deer, wild turkeys, raccoons, foxes, brown pelicans and other seabirds. 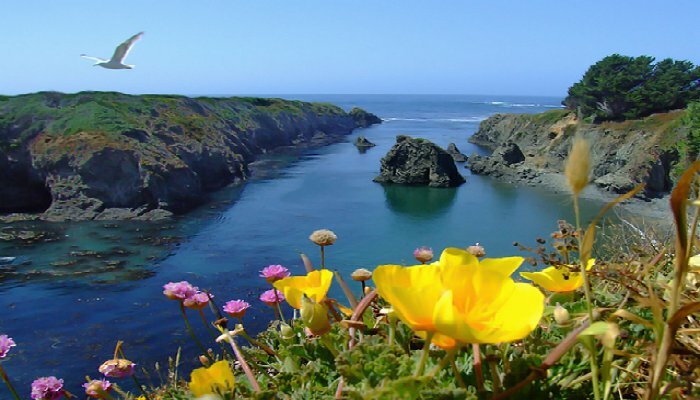 Continuing north, Highway 1 will cross Russian Gulch where you can access Russian Gulch State Park. This park is known for the heavily forested Russian Gulch Creek Canyon, a headland that features the unique Devil’s Punch Bowl. 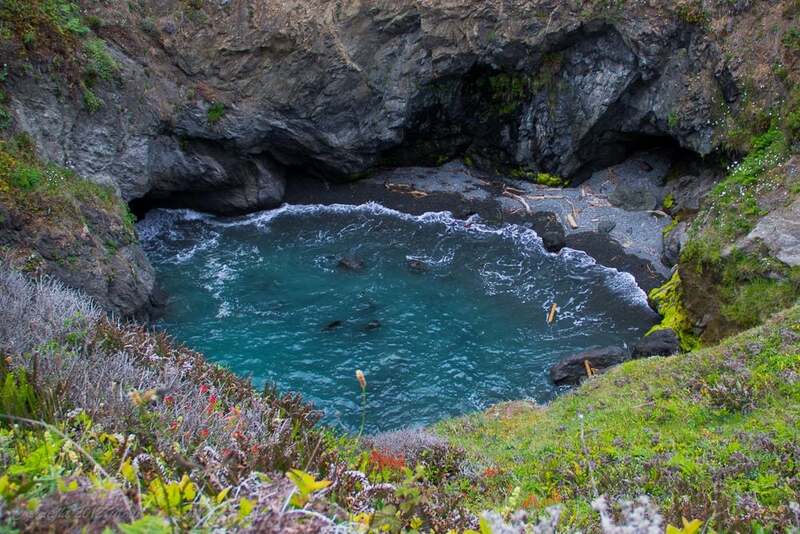 It’s a large, collapsed sea cave with churning water. Depending on the tides, it can go from very calm to a washing machine-like churning pool in minutes. 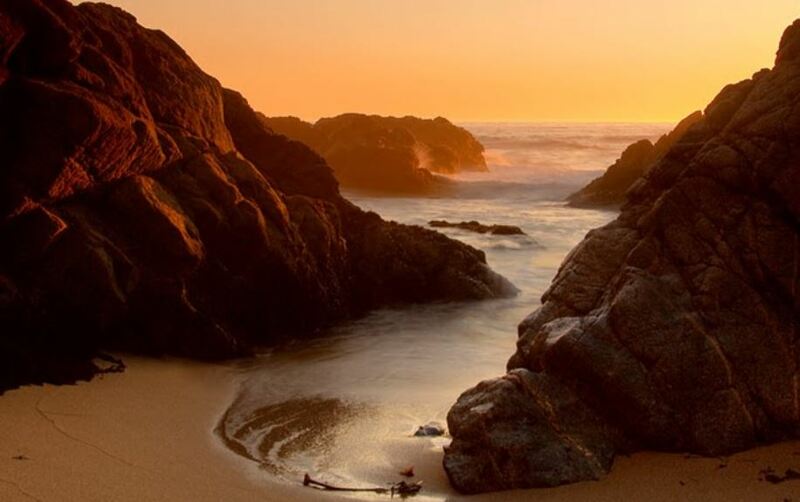 The beach offers swimming, tide pool exploring, skin diving and rock fishing. 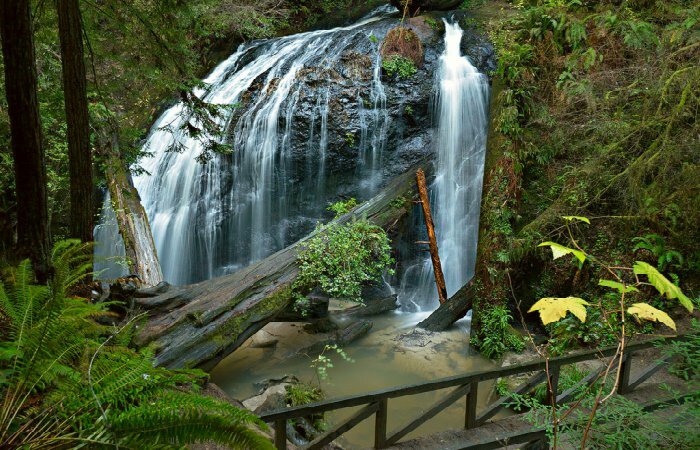 Inland, there is a 36-foot high waterfall and is worth the hike. In fact, those who like to hike will enjoy miles of hiking trails. The park also has a paved three-mile bicycle trail. Of course, you’ll also get to drive across another tall one – the Frederick W. Panhorst Bridge. 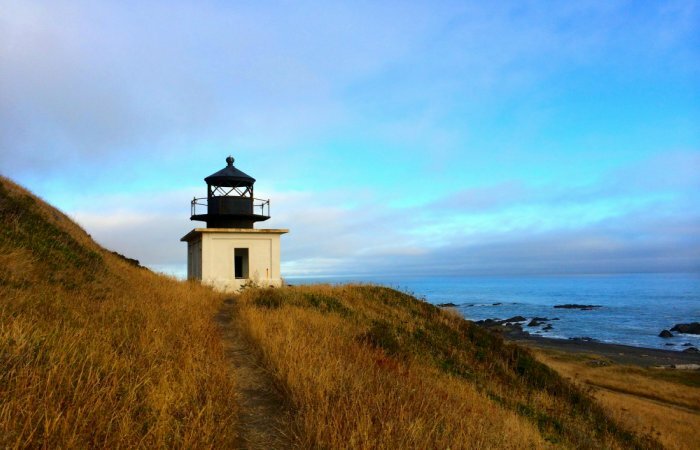 The Point Cabrillo Lighthouse complex is located about 1.5 miles north of Mendocino, California, and includes the lighthouse itself together with several outbuildings. Most of the original structures remain, but the barn is missing: in 1986 it was destroyed in a fire department exercise. The remaining lighthouse station is “one of the most complete light stations in the United States”. Jug Handle State Reserve Beach is perhaps the warmest beach in the area. 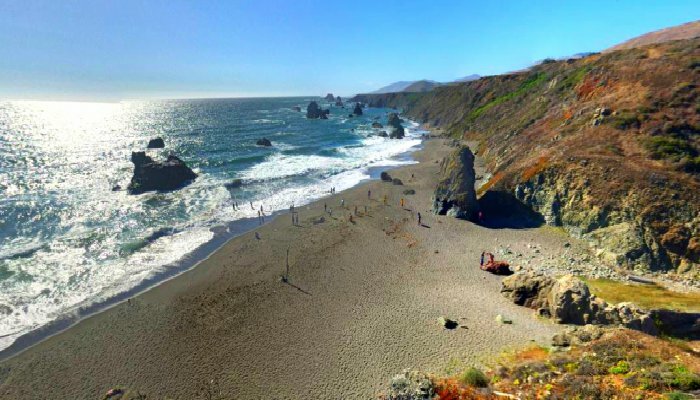 Just two miles south of Fort Bragg city limits, the quarter-mile trail from the parking lot leads you to this quiet gem, where you’ll see people lounging on blankets or beachcombing in their swimsuits. That’s because the water is 52 degrees and the air temperature is 55. This wonderful gift of nature, with its azure water, warm sand, and gentle breeze might even fool you into thinking you’re someplace tropical! 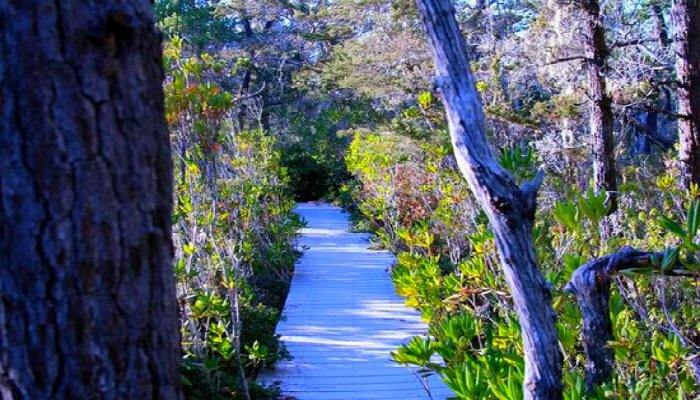 Bring some walking shoes and take the Jug Handle Reserve Trail to the 70-acre Hans Jenny Pygmy Forest Reserve. 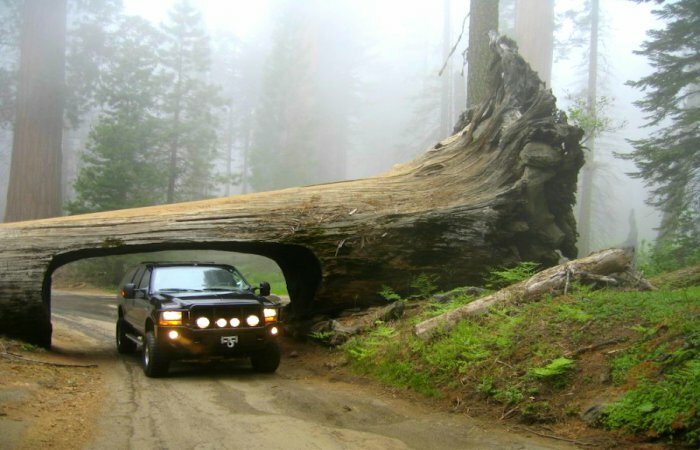 Some of the trees found there grow nowhere else in the world. Jug Handle Reserve Trail is extra unique because it may be the only place in the world to see both giants (redwoods) and pygmies (stunted trees) in a single 45-minute forest walk. Mendocino Coast Botanical Gardens is absolutely one of the most awesome gardens we have experienced in quite some time. 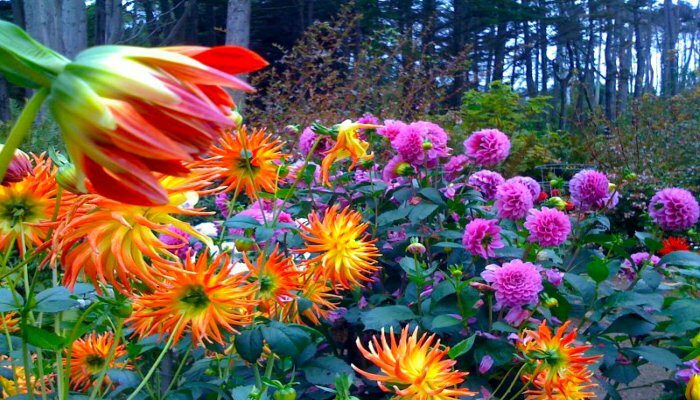 We toured the entire 47 acres, saw turkey, deer and fawns, fabulous plants and flowers, and ended the day with a picnic amongst the dahlia garden. Back on the highway, SR1 passes through a roundabout just south of the intersection with the western terminus of State Highway 20, where it widens to two lanes, then bridges the Noyo River at Noyo, crossing the new concrete bridge. Then Highway 1 becomes Main Street of Fort Bragg, and crosses the California Western Railroad. Speaking of railroads, if you have time, hop aboard the Skunk Train. 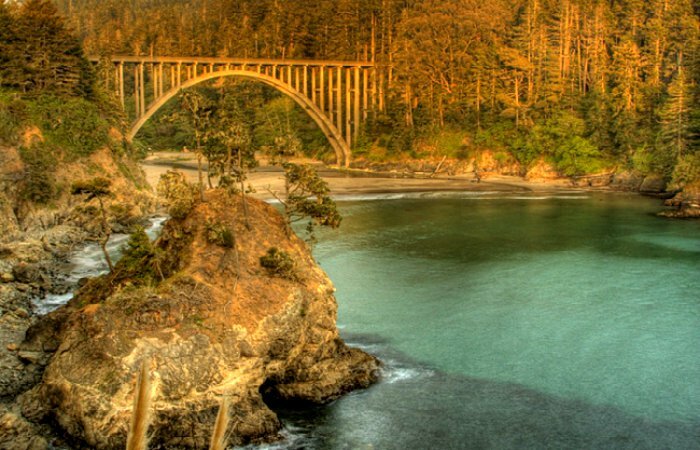 It’s a ride that takes you on forty miles of railroad running through majestic redwood forests, scenic mountain meadows, and over 30 trestles bridging the pristine mountain waters of Northern California. Watch the quick video to see some of the sites and learn more. Seriously. Who would have thought that trash would eventually become this. Highway 1 passes some more lovely beaches. 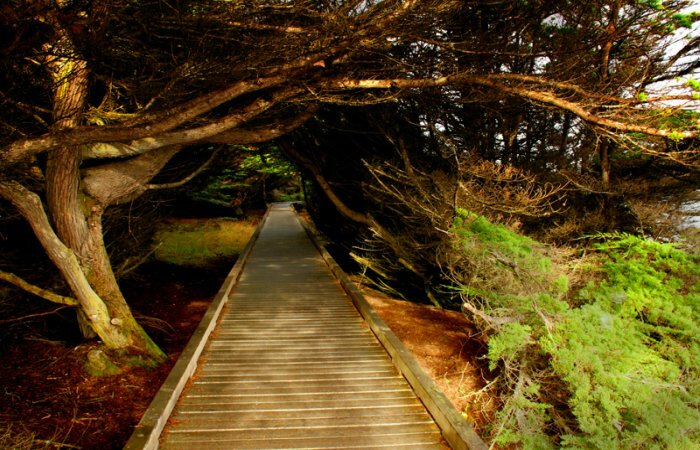 It also passes MacKerricher State Park which offers yet another variety of habitats; beach, bluff, headland, dune, forest and wetland. There is an awesome boardwalk that goes around Cleone Lake that you do not want to miss. More than 90 species of birds visit or live near Cleone Lake, a former tidal lagoon so keep your eye out for birds. 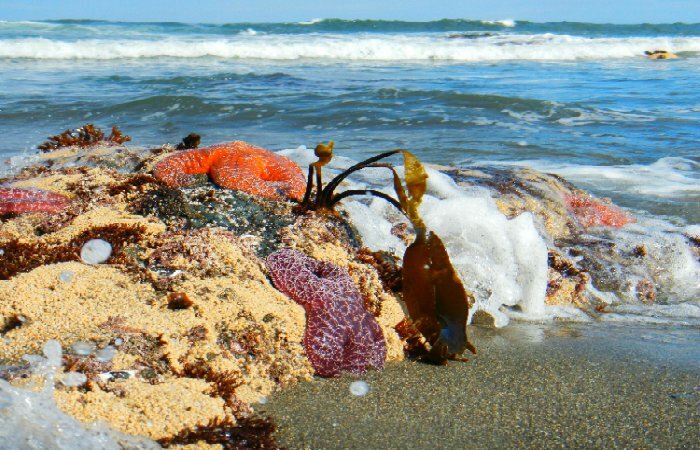 Abundant and lively tide pools are also along the shore and they have all sorts of marine life. Seals may also be seen on the rocks off the park’s coastline. 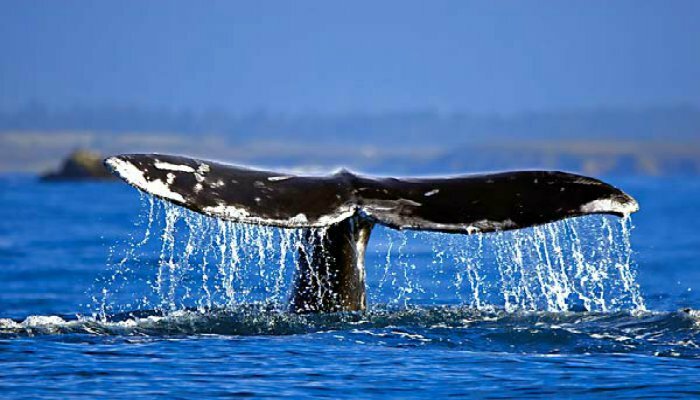 During winter and spring, the nearby headland also provides a good lookout for whale watching. If you miss the boardwalk, don’t worry. Here is what you’ll be driving through when you continue north. You will drive through the towns of Cleone and Inglenook before crossing Ten Mile River. 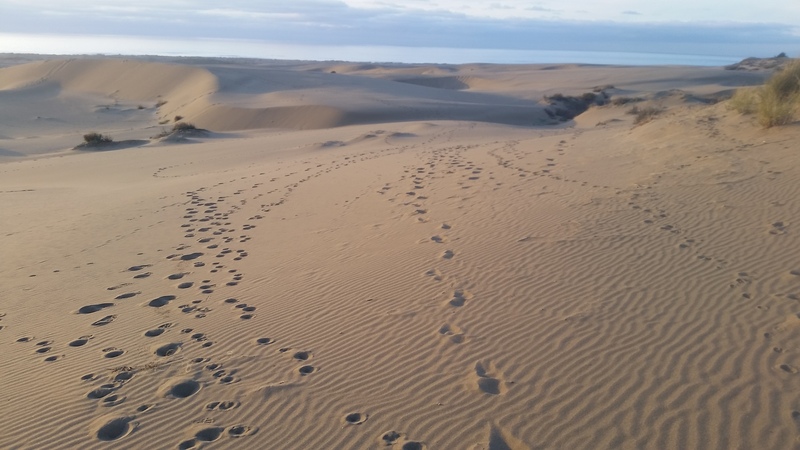 The Inglenook Fen-Ten Mile Dunes Natural Preserve encompasses nearly 1,300 acres of coastal dunes within MacKerricher State Park that extend from Ward Avenue north to the Ten Mile River. The Ten Mile Dunes complex, which includes Inglenook Fen, is a natural heritage treasure of statewide significance. It is comprised of a unique, relatively pristine native dune and wetland ecosystem that supports three federally and state listed species. The Inglenook Fen, an ecological intermediate between a bog and a marsh, is the only known remaining coastal fen in California. The last and final sights you’ll be seeing of the seascape pass Westport-Union Landing State Beach. After that, Highway 1 goes through a series of redwood-forested switchbacks before reaching Rockport. 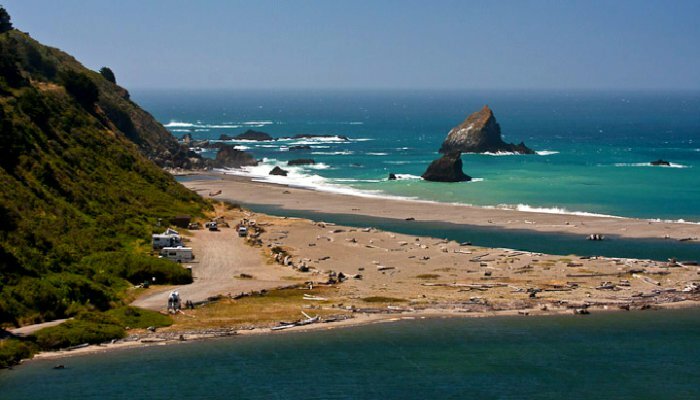 Rockport is regarded as the southern end of the Lost Coast region. North of Rockport, the highway turns away from the Lost Coast to avoid steep and unstable highlands created by Mendocino Triple Junction uplift. 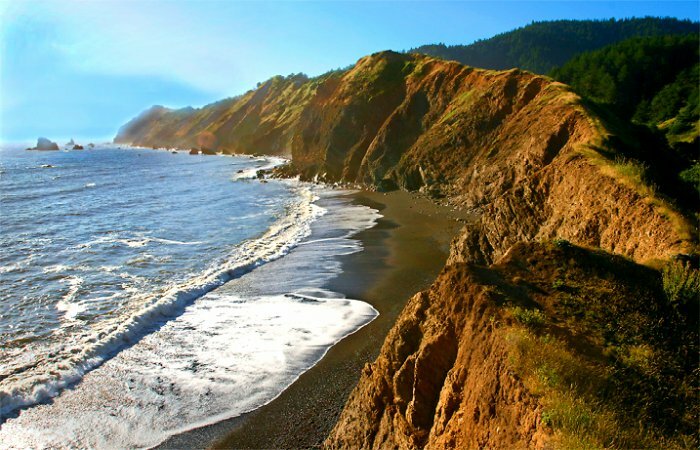 The Lost Coast is a mostly natural and development-free area of the California North Coast in Humboldt and Mendocino Counties, which includes the King Range. 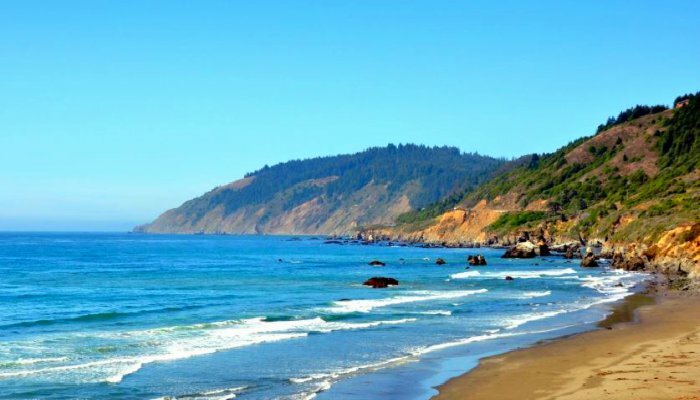 It was named the “Lost Coast” after the area experienced depopulation in the 1930s. 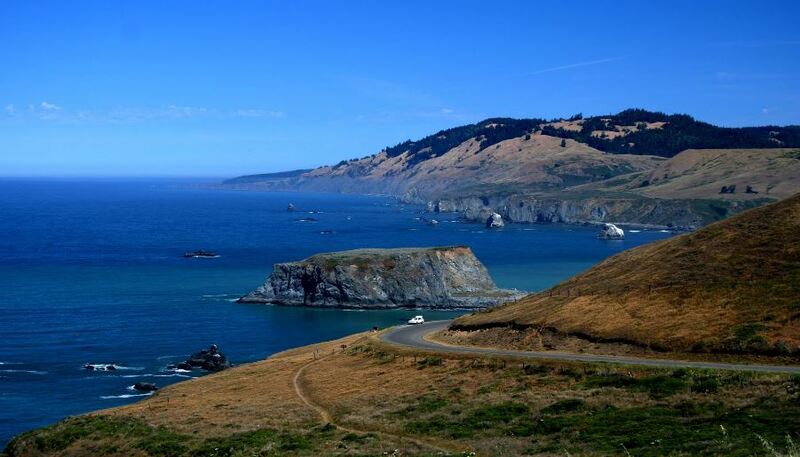 In addition, the steepness and related geotechnical challenges of the coastal mountains made this stretch of coastline too costly for state highway or county road builders to establish routes through the area, leaving it the most undeveloped and remote portion of the California coast. Hikers love it and say it’s beyond comparison. 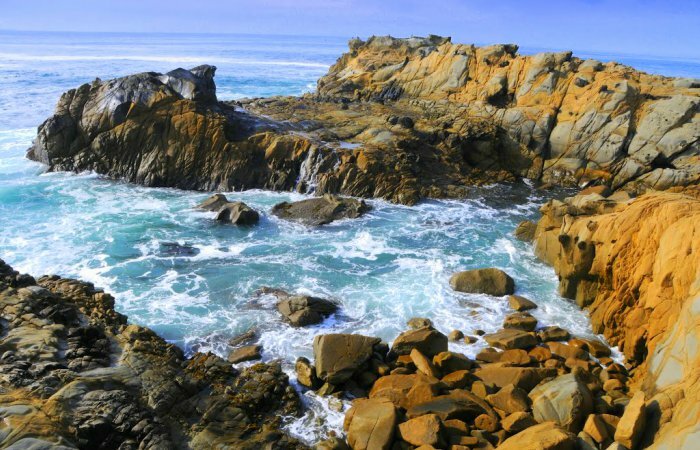 Call of the Wild can take you on a 6 day long 25-mile trail which is primarily a beach route and hikers swear that it is probably the most pristine stretch of coastline in California. The route takes hikers past the old Punta Gorda lighthouse, where they will see see relics of early shipwrecks, old pioneer cabins and ranches, seabirds, sea lions, and other marine wildlife. 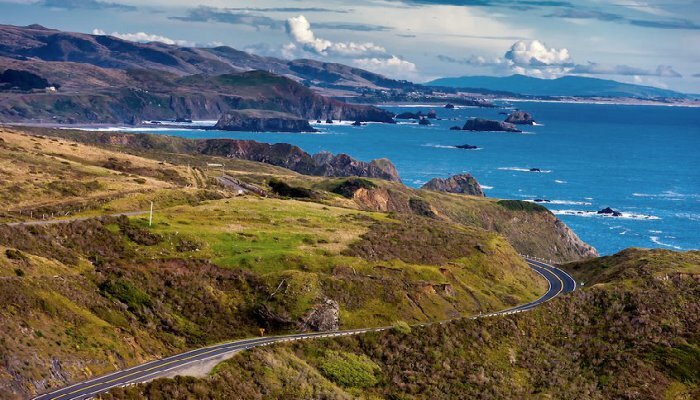 Without any major highways, communities in the Lost Coast region such as Petrolia, Shelter Cove, and Whitethorn are isolated from the rest of California. Highway 1 turns and then follows Cottaneva Creek inland. It travels through redwood-forested mountainous terrain. Be on alert – the play of light shining through the trees and the intense turns make for a pretty dangerous end of the drive. You’ll want to keep an eye out for fallen trees as well. 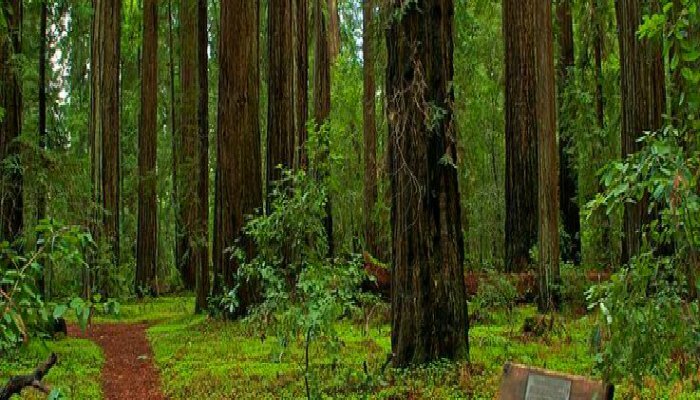 There are several places to stop and see Redwood Trees and there are also a few picture worthy and interesting stops along the way. Highway 1 eventually terminates completely at US 101 just outside Leggett. You’ll want to head back south just a couple of miles to visit Drive Through Tree Park. Then turn back around and head north again for the 45 minute drive to Avenue of the Giants. 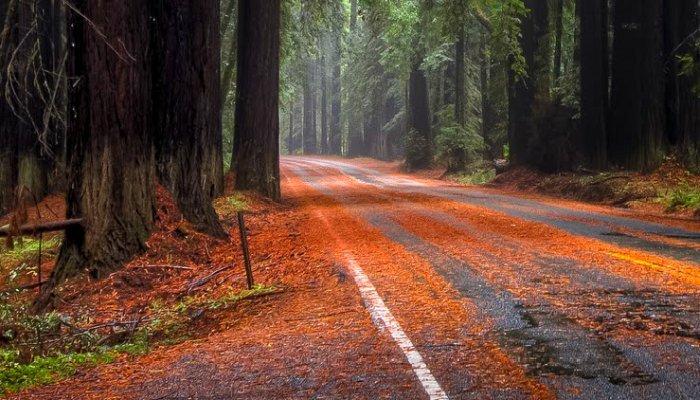 This world-famous scenic drive is a 31-mile portion of old Highway 101 and encompasses 51,222 acres of redwood groves. It is by far the most outstanding display of these giant trees in the 500 mile redwood belt and is accessible to all with convenient services provided along the way. Fog is the most likely hazardous condition on this road trip. 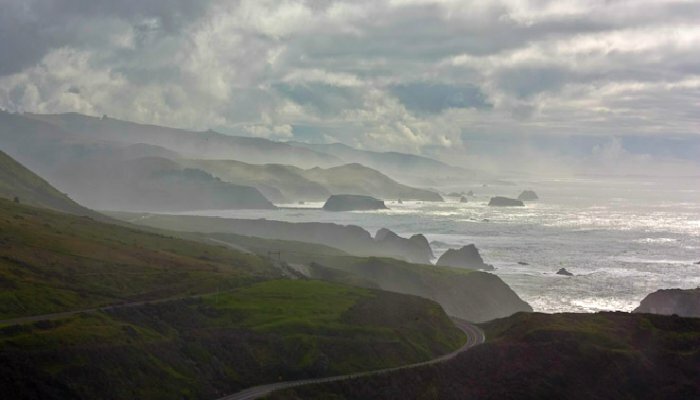 Highway 1 can get seriously fogged in and make driving conditions very hazardous, especially as drivers navigate around blind hairpin curves so stay safe and make sure to check the weather before you hit the road! Sources: 1, 2, 3, 4, 5, 6, 7, 8, 9, 10, 11, 12, 13, 14, 15, 16, 17, 18, 19, 20, 21, 22, 23, 24, 25, 26, 27, 28, 29, 30, 31, 32, 33, 34, 35, 36, 37, 38, 39, 40, 41, 42, 43, 44, 45.